Below are summaries of a number of talks based on their tweets. 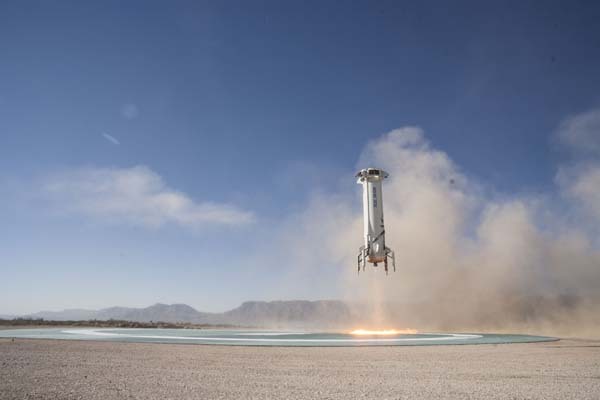 The talks included Erika Wagner of Blue Origin, Dylan Taylor of Space Angels, John Quinn of Exos Aerospace, Tim Lachenmeier of Near Space Corporation, Lewis Groswald of the University of Colorado Boulder, and Alain Berinstain of Moon Express. Anybody else think this is a strange policy? A.) NASA spends a great deal of money and manhours certifying any rocket capsule their people ride to orbit on, providing jobs, and controlling *when* these capsules actually become operational. This is politically useful when going to Congress for money for all the other NASA programs. B.) Allowing NASA astronauts, or anyone else in government, to ride on the much larger number of possible sub-orbital launch vehicles, would require a *much* larger certification program, or would mean more than one exemplum of NASA personnel riding into Space (beyond the Von Karman limit of 100 kilometers), and surviving quite well. That would call into question the real reason for the existence of the present certification programs. C.) Since those certification programs are vital to Congressional Chairs extending the time over which they have influence on human spaceflight, and on their local communities that profit from government spaceflight, NASA would be making enemies it cannot afford, by decreasing the clout of these members of Congress in the near future. IMHO, we are still in the pre-industrial era of spaceflight. This stems from the correct definition of industrial revolution given by Arnold Toynbee, in 1884. “When a society moves from allocating resources by custom and tradition (read here, politics) to allocating resources by markets, it can be said to have undergone an industrial revolution”. Total government control over spaceflight during its first 30 years marked its exclusion from the social processes of the industrial revolution’s and their usual acceleration of productivity. The fight over the next 25 years to keep spaceflight a government monopoly, ended after the Columbia disaster, for 5 years, in the beginning of the COTS program. Then, in 2009, that fight was picked up again by the congressional NASA funding committees. It continues, with slowly weakening strength levered against the growth of market-oriented spaceflight, and against any exemplums that would weaken the ways in which their leverage can be applied. Wow, thank you for this comprehensive response. Great points all. Cheers. There is also the factor of likely when they decided this policy, and what suborbital that would be, if I were to guess they decided this either during the development of VG’s Spaceship 1 or shortly thereafter, Branson is heavily connected to the middle east, and their oil, which was a politically strenuous issue. An excellent analysis of the politics, Tom. However, this ban ignores the reality that many, many years ago Neil Armstrong and a number of other X-15 pilots made suborbital flights at a time when they were government employees. NASA had no control of that program, which ran in parallel to NASA’s Mercury program.